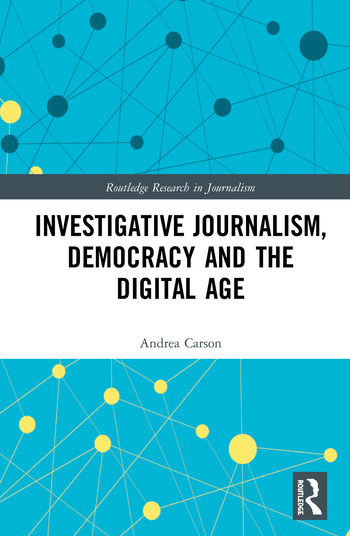 Theoretically grounded and using quantitative data spanning more than 50 years together with qualitative research, this book examines investigative journalism’s role in liberal democracies in the past and in the digital age. In its ideal form, investigative reporting provides a check on power in society and therefore can strengthen democratic accountability. The capacity is important to address now because the political and economic environment for journalism has changed substantially in recent decades. In particular, the commercialization of the Internet has disrupted the business model of traditional media outlets and the ways news content is gathered and disseminated. Despite these disruptions, this book’s central aim is to demonstrate using empirical research that investigative journalism is not in fact in decline in developed economies, as is often feared. 2. What is Investigative Journalism? Andrea Carson is a political scientist and an Associate Professor in the Department of Politics, Media and Philosophy at La Trobe University in Melbourne, Australia. She has authored numerous articles on investigative journalism, Australian politics, election campaigns and digital media. Her most recent co-authored book is Australian Politics in the Twenty-First Century: Old Institutions, New Challenges (2018). She was awarded Australian Research Council (2018-2021) funding as part of a team using big data to understand the media’s role in political debate and policy decisions. She holds a PhD in Political Science and a Master of Arts in International Politics. She has taught courses on journalism, political communication, women in politics, and campaigns and elections. She worked as a newspaper journalist and section editor at The Age in Melbourne from 1997-2001 and as a radio broadcaster (RRR) and radio and television producer (Australian Broadcasting Corporation) from 2001-2010. She is a regular media commentator and examines the latest media trends and issues for The Conversation’s ‘Media Files’ with colleagues, available on iTunes.